Let your smile do the talking. You would be surprised to know that discolored teeth are a problem faced by a lot of people in the world. However, at TLC Dentistry, we understand that some of you might want to sit in for a session and get your teeth professionally whitened while others might want to do it themselves in the privacy of their house. We have both these areas covered. Take-Home Whitening with Custom Trays: Take-home teeth whitening is for those of you who don’t mind a slower route to getting whiter teeth. This process takes about 15 – 30 minutes a day and results might take 1 – 6 weeks to achieve your desired shade. In this procedure, we make your custom whitening trays. Professional results – in the comfort of your own home! In-Office Whitening: In-office teeth whitening is for those who are wanting a brighter smile fast. 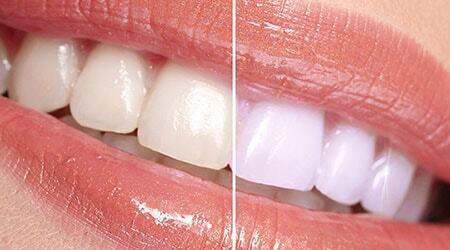 Its powerful and safe whitening gel can whiten your smile in about 40 minutes, right in the dental chair. TLC is exactly that! Best dental services delivered by an awesome team of attentive, trustworthy, and caring professionals. I've been a TLC patient for 30+ years. Is it Time Your Smile Did the Talking? If you want to find out more about teeth whitening, call us now for a special consultation at (831) 757-1038.